Living Landscapes is the title of a series of seminars aimed at creating a scientific arena for arguing on contemporary research’s challenges related to landscapes as places to live-in, produced by living alongside planning practices. Current global and local forces are reshaping physical and social urban and regional landscapes, and the relationship between their own defining features. There is evidence that over the past decades a far-reaching change has been taking place in the very nature of the urbanization processes along with the landscapes shapes. It might be defined as a shift from a metropolitan mode of urban development to a post-metropolitan era. It opens up a new discourse on the ongoing planning challenges such as policies to manage the emerging issues on climate change and resilience; strategies to address a new approach on landscape planning that takes into account “beauty” in itself and “ordinary beauty” as a result of the everyday life practices; tools to include the “diversity” in the urban policy making, etc. The collection of papers presented in the following pages intends to provide a path for analysis and figuring out that might contribute both to the planning theory’s debate on landscape and to practices’ domain as well. Basically all of the contributions and suggestions brought together in this anthology suggest a plural and cross-cutting concept of landscape and build up on the traditional theories. They include different meanings of landscape(s) and propose diverse planning perspectives. They give a picture of the contemporary research efforts of young and senior researchers on landscapes for living. Camilla Perrone, Gabriele Corsani, Giancarlo Paba, Giuseppe De Luca, Raimondo Innocenti, Fabio Lucchesi, Raffaele Paloscia, Daniela Poli | PhD Board, Department of Architecture, Urban and Regional Planning Unit, University of Florence. Sara Bartolini, Chiara Belingardi, Elisa Bertagnini, Rita Biconne, Giulia Carlone, Luna D’Emilio, Luca Di Figlia, Chiara Durante, Mariano Gesualdi, Silvia Minichino, Claudia Roselli, Maddalena Rossi, Stefano Reyes, Andrea Saladini, Matteo Scamporrino, Chiara Serenelli | PhD Students, Department of Architecture, Urban and Regional Planning Unit, University of Florence. These Proceedings include the papers accepted for presentations at the PhD Course titled "Living Landscapes (Landascapes for living). Polices, practices, images" under the PhD Program in Urban and Regional Planning held in the Department of Architecture, Urban and Regional Planning Unit, University of Florence, from February to June 2012. Only the Authors who were regularly registered for the Conference and agreed to publish their contributions were included in the Proceedings. * Siete interessati a realizzare una pubblicazione con Planum. The Journal of Urbanism? Per proposte di Atti di Convegni, servizi monografici o articoli, contattate la Redazione di Planum | Per maggiori informazioni consultate la sezione 'About'! 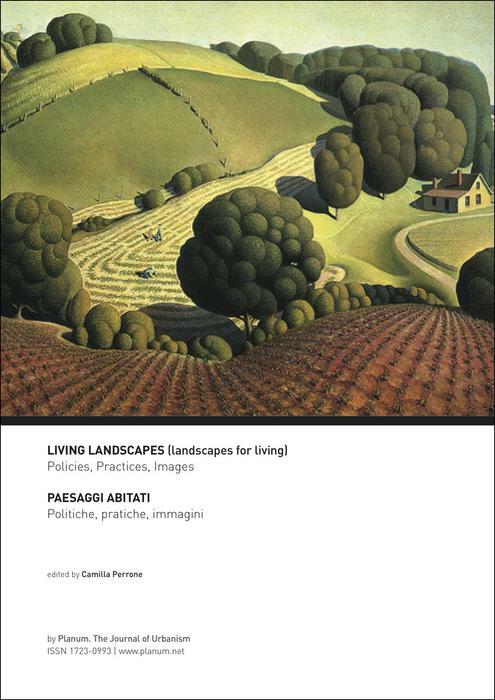 The Course ‘Living Landscape (Landscapes for Living): Policies, Practices, Images’ has received the Excellence Teaching Award 2013 from AESOP - Association of European Schools of Planning. All rights reserved. No part of this publication may be reproduced, stored in a retrieval system, or transmitted in any form or by any means, electronic mechanical, photocopying, recording or otherwise, without the prior written permission of Planum. The Journal of Urbanism.